I don't very often take on a project for a second party, but this one intrigued me. It was to be used as a wedding gift for a fellow cellist in Denmark, and the client was very easy to work with as well as extremely appreciative. Thanks to Rockler Woodworking and Hardware for the referral. 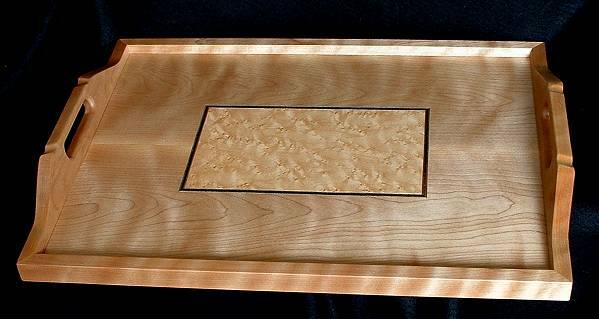 Solid maple serving tray with birds-eye maple veneer inlay and dark banding border. The inlay with banding was the client's concept. The tray bottom is bookmatched, 3/8-inch thick. Tray measures 16x22. Finish is a wiping varnish. 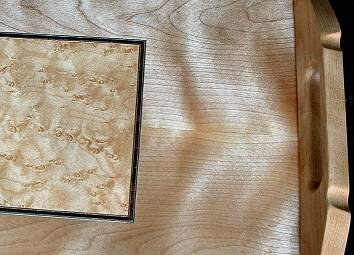 Though not true curly maple, some figuration came to the light as the piece was finished. It helps highlight the book-matching. Handles skew outward at about 10 degrees. Due to the large size of the tray, thumb grooves in the handle help steady a heavy or unbalanced load. 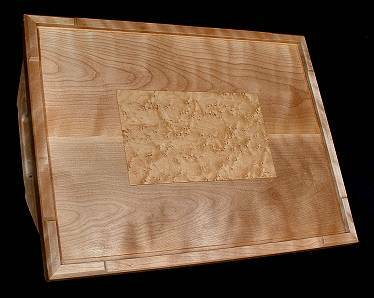 A matching veneer inlay was set into the back in order to stabilize the shrinking or swelling effect of the front inlay. Corner feet were shaped into the bottom to help prevent wabbling. A bevel was shaved off the outside bottom edge of all the sides to give the effect of floating above the counter and to minimize their height.